c. How we meet on a monthly basis — full booster meetings in odd numbered months and just the board and the band director in even numbered months. Please review these bylaws and contact either myself or another board member to discuss any questions you might have. We will be voting to enact these By Laws next month. In the spirit of the expected changes with that will be made by these by laws, we will be setting forth a slate for the positions of President, Vice-President of Volunteers and Publicity and Secretary. You will find detailed job descriptions for these positions in the attached By Laws. If you are the parent of a student who will be in the Salem High School or Andrew Lewis Middle School bands over the next two years and would like to run for one of our board positions, please contact me at Melanie@tanjents.org. We would love to welcome have some new members on our Board to help and support our growing band program! We will be emailing the proposed slate of officers next month to be voted upon at the May concert. An officer’s term runs begins on September 1 and runs for two years. If you have any questions about any of the board positions, please contact me. We noticed that the high school redid their website recently, and the Pride of Salem site is no longer linked from there. This may make it difficult for you to find some of the information Mr. Wright publishes for you. The calendar on the Band Boosters site — http://www.salembandboosters.org/calendar/ — is also kept current. Bylaws and Committees — How you can help! Below you will find links to the final revision of the bylaws as well as the Band Boosters Board positions and committee descriptions.The bylaws will be voted on at the Spring Concert in May. Moving forward, beginning with Thursday, May 3, our Band Boosters meetings will be held on the first Thursday of each month in the SHS band room unless otherwise notified. We will not meet in July (Summer Music Games Meeting only), August (band camp month), December (Holidays and Concerts makes for a short month). We are very proud of the hard work that our band students and directors put forth to keep the The Pride of Salem and The Pride of Lewis band trains on track and in motion. Mr. Wright and Mr. Graham have made our band programs so exciting and engaging that more and more students are asking to join. When the band grows so does the Band Boosters need for volunteers! Just like a train, there are a lot of moving parts and behind the scene work that has to be done to keep the band moving. Please review the committee description to see if there is a committee you would like to join. You will have the opportunity at the the SHS and ALMS Spring Concerts in May to sign up, so think about it… and pick one! Teamwork makes the Dream Work… not to mention working with band family makes for loads of great memories for you and your band student! If you want to help, but don’t feel that a specific committee is your style, then you will have the opportunity to sign up just to volunteer as needed. “As needed” could mean volunteering at the Summer Music Games or VMBC, baking cupcakes, helping deliver strawberries or fruit, delivering posters or helping with a specific need from one of our committees. Parents, Grandparents, Aunts, Uncles, previous Pride members are all welcome to help…. after all, we are a Band Family! If you have any questions at all or see a committee that you would like to join now, because you just can’t wait for the fun to start, please feel free to respond to this email or you can contact Melanie Burton at melanie@tanjents.org or Teresa Sizemore Hernandez at tes129@gmail.com or Dawn Evans at dawnevans8000@gmail.com. Posted in Uncategorized	| Comments Off on Bylaws and Committees — How you can help! Great opportunity to raise money for your student for Disney!!! The Salem Civic Center has contacted the band boosters with an opportunity to help with costs for the Disney trip. 10 adults and 5 (16+) students are needed to help with concessions this Friday night (10/13) for The Lacs concert. $10 per hour worked will be credited toward your Disney trip costs. Meet Sam Terry at 5:30 in the “Community Room” at the Civic Center (to the left of the main entrance) to sign in and get instructions. The show should end at about 10:00pm. A contact number for the Civic Center is 540.793.0987. Dress is very casual, comfortable shoes. Please send an email to jt@suntancity.com by this Thursday (10/12) at 4:00pm if you are available to help. Friday Aug 25 — Away game at Amherst HS. Muster at SHS at 3:45. Uniform is blue jeans, black belt, and band show shirt. Tennis shoes only. Friday Sep 1 — First home game! Show & Uniform debut! Band pictures will be taken at SHS before the game. Muster at 1:30. Dinner will be provided. The car wash previously scheduled for the 3rd has been cancelled. The Pride of Salem is starting their popcorn fund-raiser, again from Smoky Mtn. Popcorn Company. A variety of specialty flavors are available, from classic cheddar and caramel corns to unique options like Birthday Cake and Chocolate Donut! Download the order form and help out the band! 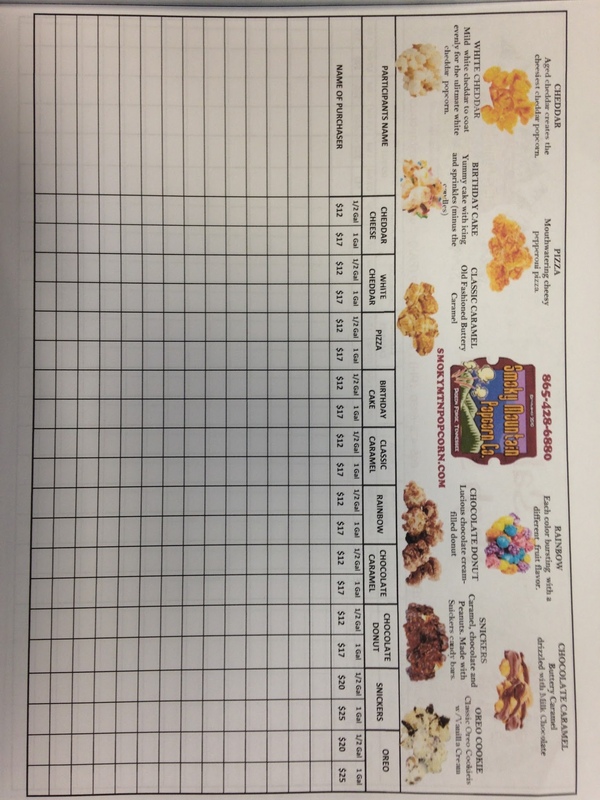 Fill up your fundraiser order forms, and need another? Need to send one to someone else? Download the files below, and print them out!